All forms like tee, elbow, reducer, coupling, Flange, Mechenical Tee, Adaptor, Ends etc. The Groove and Tongue faces of these flanges must be matched. One flange face has a raised ring (Tongue) machined onto the flange face while the mating flange has a matching depression (Groove) machined into it's face. We are engaged in manufacturing a wide range of End Machines catering to the requirements of our esteem clients. These designs are available in different sizes and dimensions. We fabricate our range in accordance with the requirement of our customers and are delivered within the stipulated time period. 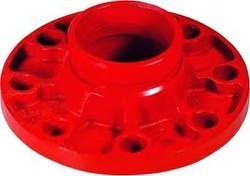 All forms like tee, elbow, reducer, coupling, Cross, mech Tee, Flange etc. All forms like Grooved tee, elbow, reducer, coupling, Flange, Mechenical Tee, Adaptor, Gate Valve, Butterfly Valve, NRV tec, Ends etc. All forms like tee, elbow, reducer, coupling etc. Grooved elbows provide an economical and efficient method of changing direction in grooved piping systems. We are successfully meeting the varied requirements of our clients by providing the best quality range of Grooved Fittings. Grooved Pipe Couplings and Fittings. Grooved pipe couplings and fittings are used to join and pipes in both wet and dry system. They provided some flexibility in terms of movement and deflection to the piping system. Rangsons Schuster Technologies Pvt. Ltd.